This is a Visual Identity and Branding proposal for The Bicycle Alliance. The Bicycle Alliance is a collective made up of several smaller organizations that banded together to create a unified front. They work to support the local bicycle community in Washtenaw county, whether that's through services, events, or aiding local bike policy. 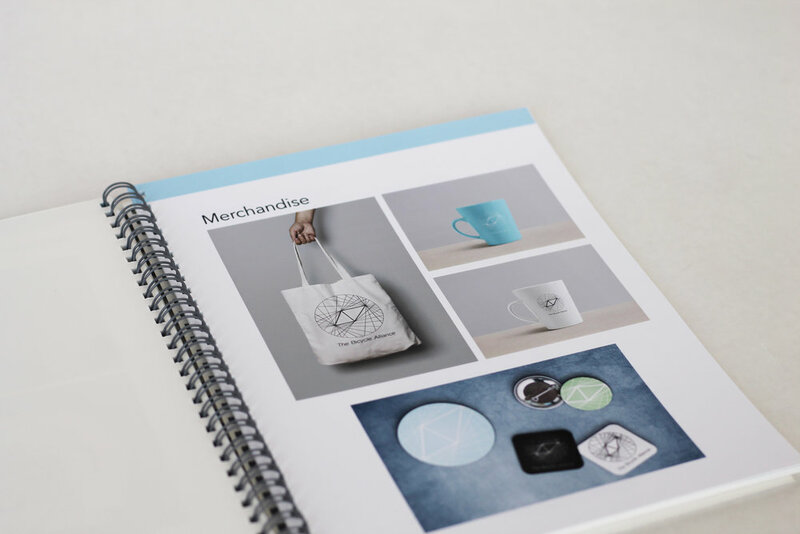 They collaborated with student designers in a course titled Visual Identity and Branding, to get a clearer vision of the potential Identity of their group. We were then tasked to create a complete Identity and Brand system that reflected their goals and missions. As I brought my design to life I wanted to focus on the support they have for each other and the unification of their identities as a whole. 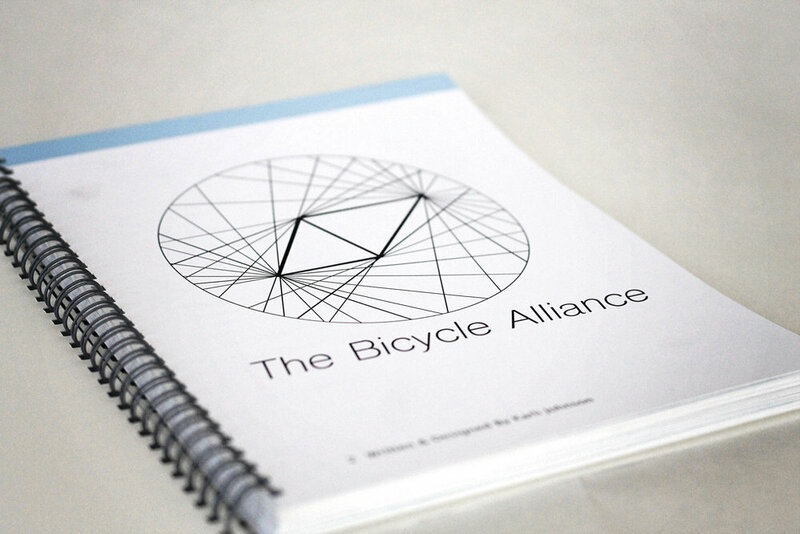 The result is a book that consists of logo development, a brand identity, posters, and more for The Bicycle Alliance. When presenting to the clients I expressed that I perceived the “Bicycle Alliance” to be a group that represents several small groups coming together to form a whole. It’s a group that has equal representation of all of the members involved. It’s a place for people interested in all forms of Bicycling to network, build, and connect. The goal for my logo was to represent a form of unity that illustrated connection. The three intersecting points represent three individual entities merging together to create a new form. Originally, I chose to make the main form an equilateral triangle because it didn’t have any points that were favored over the other. It also represented a shape that is often seen in the structure of bikes. After presenting it to the clients, they expressed, the lack of connection to the bicycle form. Moving forward with their advice, the final logo evolved from the base of the bike. It symbolized the support, and core of the bike, which I think more accurately represented the purpose of the different groups joining together to a create “The Bicycle Alliance”, essentially a support system. I also incorporated the spokes of the bicycle wheel to project an idea of moving forward with momentum. Overall, this project was focused on representing a community in a welcoming and professional visual identity while giving the group power and organization in functionality. They needed a visual identity that united them, connected them, and allows them to communicate freely. This was the goal during each phase of the design, especially in the Poster and Advocacy designs. As I designed, I kept in mind that “The Bicycle Alliance” was in a beginning phase, and that their main audience was the members of the group. But, I also knew that once the group developed a foundation, they would need to look toward a future audience. I believed they could move towards a place for activism/ political power of a union in terms of bike advocacy, safety, and programming. When designing for their potential campaigns, I focused on women ( which is a demographic that is often not catered to in the bicycle community) and safety. With the Trailblazing Women poster, I hoped to create a space that welcomed women, as well as set up a larger series for “The Bicycle Alliance” to build off of. Then, in terms of safety with the “5 ft” poster, I wanted to create something that clearly voiced a concern, so that as a driver passed it they thought more about who they share the road with. Both posters are represented above. Below are images of the VIB book in its final form.